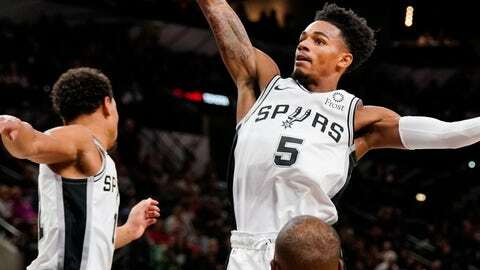 Dejounte Murray was driving past James Harden and on his way to the basket, showing one of the skills that made the San Antonio Spurs convinced he’s the right point guard for their team. And then Murray’s knee gave out. In an instant, the entire trajectory of the Spurs’ season might have changed. Murray’s season is almost certainly over, after the Spurs learned Monday that their starting point guard has a torn ACL in his right knee. The team hasn’t revealed when Murray will have surgery, nor has it determined a timetable for his return, but ACL reconstruction and rehabilitation is a process that typically takes around a full year. Murray, who turned 22 last month, averaged 8.1 points, 5.7 rebounds and 2.9 assists last season. “I assume he misses the season,” Popovich said. In a tweet, Murray thanked people for support and said he’s “been beating the odds and handling adversity” throughout his life. Murray was a second-team member of the NBA’s All-Defensive Team last season, the youngest player to ever earn such a distinction. He was also going to be the starter for a team that is chasing a 22nd consecutive postseason appearance, which would tie the NBA’s record. Instead, the Spurs are likely going to have to choose between letting Derrick White take the starting gig or finding help elsewhere. Murray became the Spurs’ starter last season, inheriting the role that Tony Parker held for the better part of two decades. Parker left the Spurs in the offseason, signing a two-year deal with the Charlotte Hornets — which means that the only person who started any games at the point last season and remains on the San Antonio roster is Patty Mills. It has been an absolutely brutal preseason for the Spurs, who were entering a transition year anyway now that the Big Three era is officially over and Kawhi Leonard was traded to Toronto. Tim Duncan retired two years ago, Parker left for Charlotte and Manu Ginobili decided over the summer to retire. And now on top of that, not only is Murray hurt but rookie guard Lonnie Walker IV will miss several weeks while recovering from a torn meniscus. Miami coach Erik Spoelstra said if a coach can figure out how to handle all this, it’s Popovich. Popovich joked Monday that LaMarcus Aldridge will start, as will DeMar DeRozan, the All-Star guard acquired in the Leonard trade. Many other things, a week away from the regular season, are now unclear. “We’ll figure out how we want to move forward, in a sense that nothing’s in stone,” Popovich said.